For farmers, it’s a problem that can quickly spoil the prospect of a successful year. After planting, growing, harvesting and storing their crops, many farmers have at some point experienced the inconvenience of grain spoilage. In Canada, it has been estimated that five per cent of crops are lost to spoilage each year. Spoilage is caused by a variety of factors. Stored grain can produce additional heat and moisture unexpectedly, which can lead to problems such as mold growth and hotspot development. But thanks to a solution developed by one Saskatchewan entrepreneur, this problem may soon be a thing of the past. Kyle Folk is the founder and president of Regina-based IntraGrain Technologies Inc. In 2012, his company launched BIN-SENSE®, a wireless grain monitoring system that is both solar and battery powered. Interest in the product has been steadily growing. Before starting the company, Folk learned firsthand how frustrating grain spoilage could be. Several years ago while vising his parents’ grain farm, Folk was assisting his father in filling a canola contract when disaster was discovered. “The canola had spoiled in the bin, which I didn’t even realize was a thing at the time,” Folk said. Folk soon began formulating the idea for his BIN-SENSE® product. Since he also owned an electrical contracting company at the time, he was admittedly hesitant to dive in headfirst with this new idea. But two months later, Folk found the platform he was looking for to take this idea to the next step through the Progress2Capital Business Planning Competition. This was a program developed by the Regina Regional Opportunities Commission (now Economic Development Regina) in 2006 to encourage entrepreneurialism and economic growth in the Regina region. 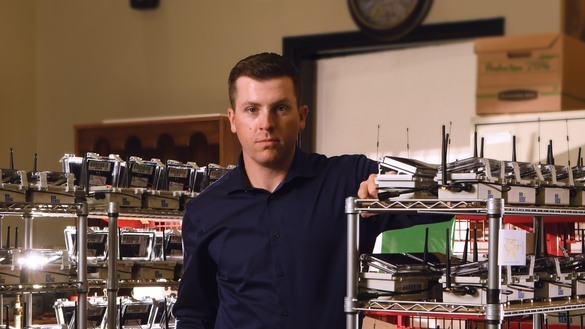 Through this competition, he was put in touch with Springboard West Innovations, which at that time helped convert Saskatchewan ideas into market-ready products. After officially forming IntraGrain and beginning to sell the BIN-SENSE® system, it was apparent that Folk had indeed created something unique. The product sold out almost immediately. “I was fortunate that family and friends were interested and took the risk in supporting me and putting up my initial seed capital to get me going,” Folk said. In the beginning, IntraGrain had a smaller client list that consisted of local farmers. At one point, Folk said he knew all of the phone numbers of his customers by heart. By attending numerous trade shows and even making individual visits to potential clients’ farms, the company’s customer base has greatly expanded to a point where all product is now sold through a retail and distribution network. Products have been sold in Saskatchewan, Alberta and Manitoba and also some to the U.S. and international markets. At the same time, the company has focused on bolstering its research and development efforts to expand its BIN-SENSE® line of products. IntraGrain’s BIN-SENSE® DIRECT system, for example, transforms a farmer’s smart phone or tablet into a hand-held monitor to read moisture and temperature monitoring cables using the free BIN-SENSE® DIRECT App. The device is Apple and Android compatible and connects to devices via Bluetooth or headphone cable. IntraGrain has sought out more facility space over the years, going from a 1,200 square-foot facility to its present location that’s over 9,000 square feet and moving later this year to 18,000 square feet. The company employs 40 people and delegates a portion to research and development. “As far as I see it, you have two options: you invest in R&D for your future, or you don’t and somebody else does,” Folk said. In 2014, Folk decided to sell his electrical contracting business and concentrate full-time on IntraGrain. These days, he’s focused on helping the company expand its international presence.